With all the recent press, Twitter’s popularity is surging. 9.3 Million visitors in March and growing. Although I’m still deciding if Twitter is right for @groovyPost, I’m sure many of you groovyReaders out there are already using Twitter. 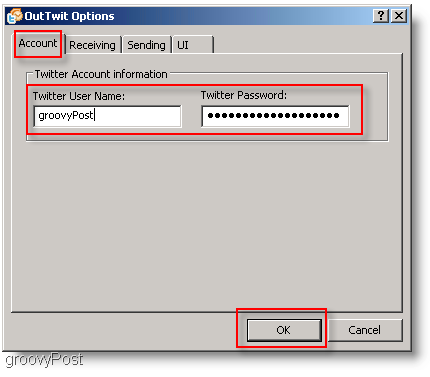 Therefore when I found this groovy tool called OutTwit I knew I had to write-up a quick article. 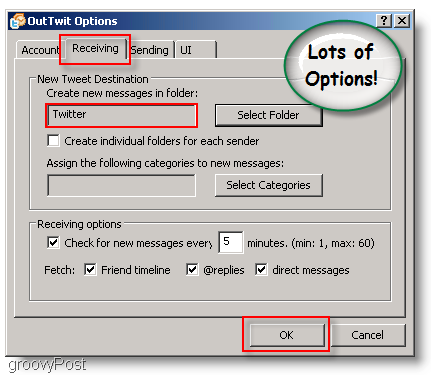 Although there are a million Twitter tools out there, OutTwit separates itself by quickly integrating itself into Microsoft Outlook (the tool most of us have open ALL DAY LONG.) This fact is the primary reason why I think it stands above the rest (for now anyway.) Oh yeah, AND it’s Freeware! 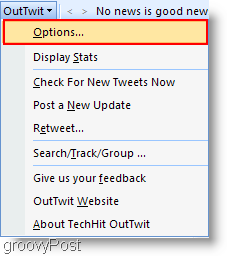 After the initial setup, all you have to do to post to Twitter is type your message in the OutTwit box and hit enter. Twitter messages from yourself and those that you follow are sent to your Outlook inbox. You can change this setting to a different folder. I would probably do so quickly before your Inbox becomes filled with Tweets. 2. Run the OutTwit_setup.exe setup file. Installation is self-explanatory. It is best Outlook is closed while installing any add-on such as OutTwit. 4. In the options window Enter your Twitter credentials. Now would also be a good time to Click over to the Receiving tab and change the default folder that stores Twitter messages. This way your Inbox doesn’t get spammed. Search, track keywords. 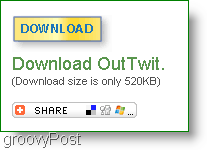 OutTwit will automatically download ALL tweets matching the keywords you specify, even if you are not following the tweet sender. This feature is perfect for keeping up to date with the Twitter buzz on your name, brand, interests, etc. 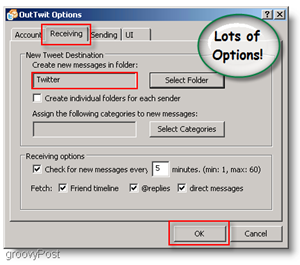 Enjoy the groovy convenience of Tweeting with all your Twitter buddies straight from Outlook!